Play Ninja Gaiden Trilogy Now! 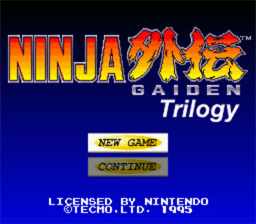 All three incredible Ninja Gaiden titles in one convenient package! There are no major changes between this version and the individual titles for the NES, except that moving to the SNES gave the games better graphics and sound.